The Epsom Family Fun Day is now a tradition. Held at Hook Road Arena is attracted over 13,500 visitors last year and hopefully more this! 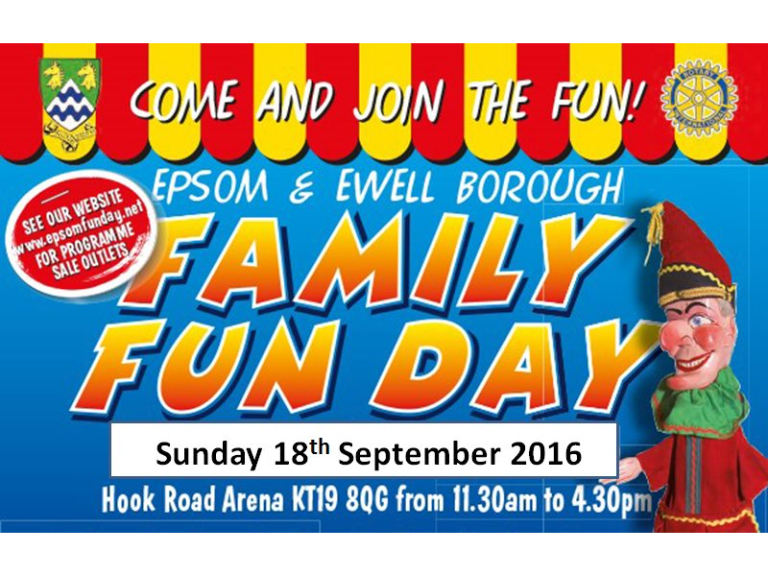 Run by the Epsom & Ewell Rotary Club – it offers everything for every age. Fun Fair – Food Court – Arena Displays and Attractions. And it also offers you the opportunity to showcase your charity, community group or business to the community. Following the success of thebestofepsomandewell Market Street last year – we are doing it again. She will be pleased to give you the full details of the pitches available. STALL HOLDER PACK DOWNLOAD which gives details. You will need to contact the Rotary direct to book these. Consider an advert – promotion your company or group to the people you count – your community. You should contact the Rotary Club direct to book these.